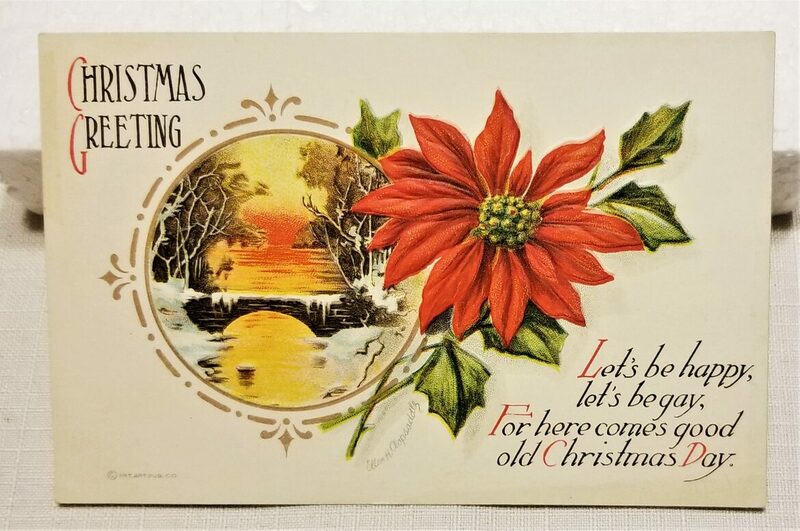 A Christmas postcard that has a beautiful poinsettia and sunrise on the front and the back has not been used. In almost perfect condition. It is in pretty good shape, but there again, I am no expert. 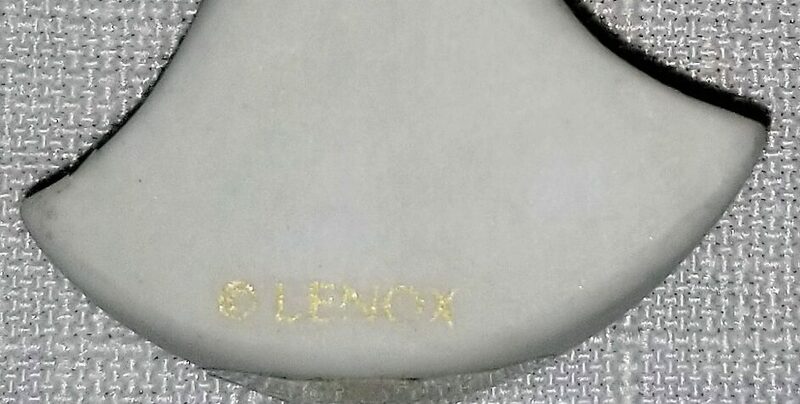 Please look at the pictures closely to identify the wear and tear. 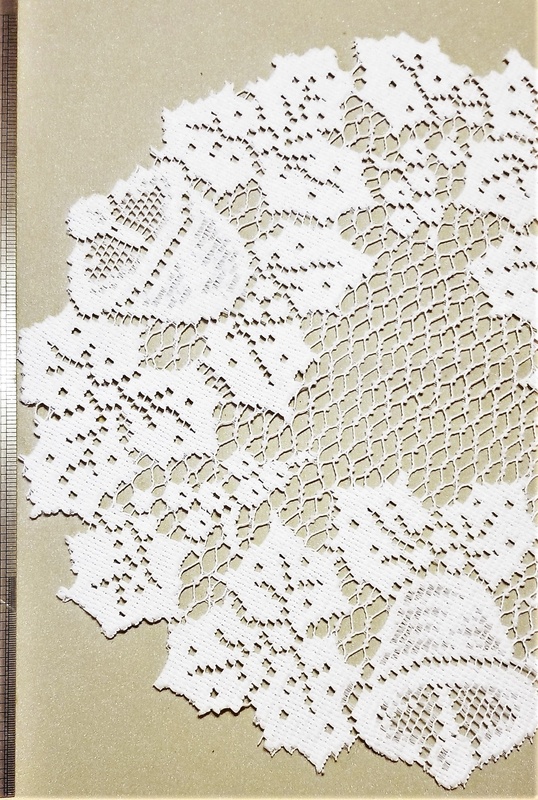 5 1/2" in length and 3.5 width. Remember, I only charge one flat fee of $6.45 for shipping, no matter how many items are ordered at one time. 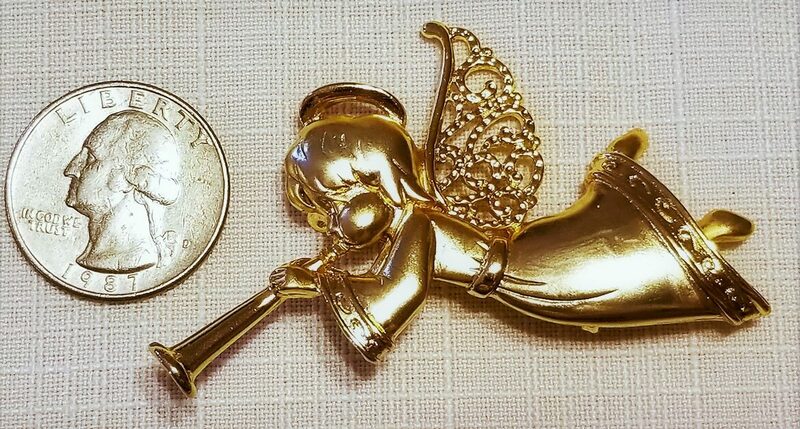 A cute, gold toned, angel pin. Made by JJ. She is blowing her trumpet. 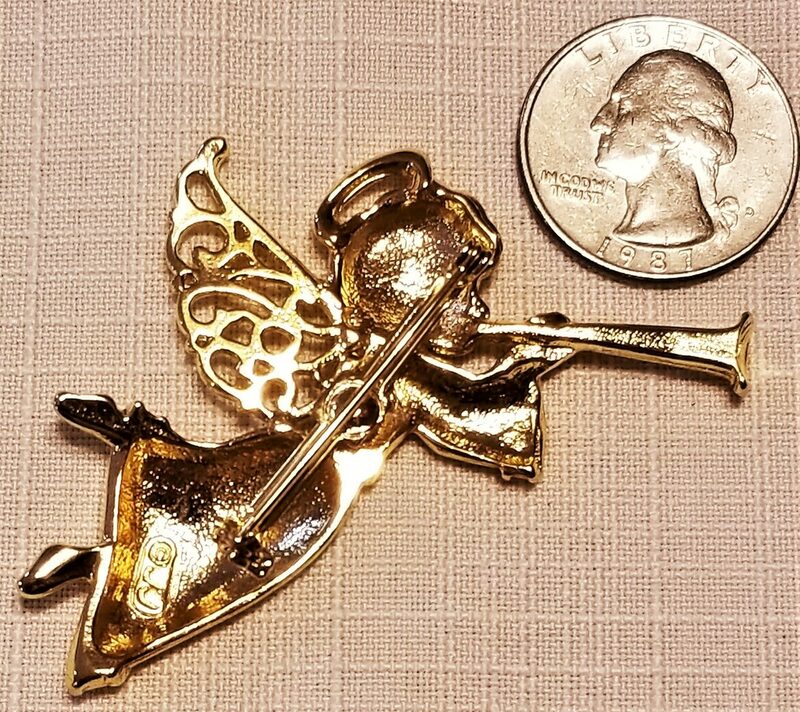 @ 1/2" in length and 2" width. 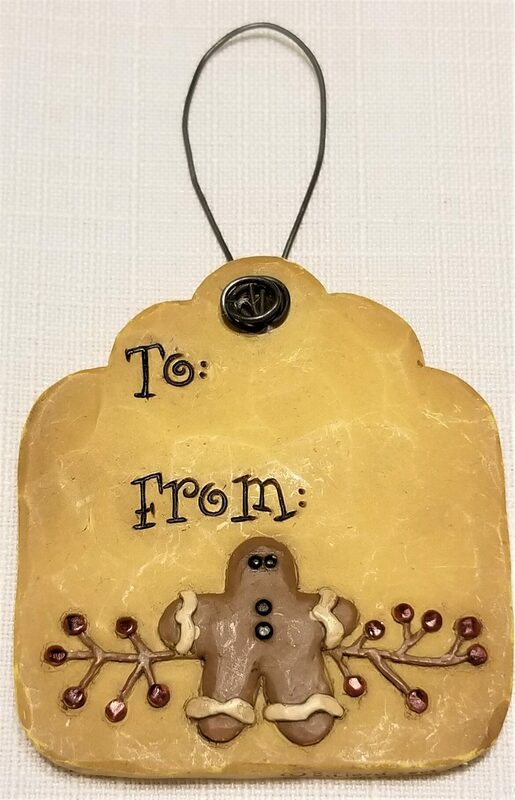 Perfect for a Christmas stocking stuffer or a token of love. Remember, I only charge one flat fee of $6.45 for delivery, no matter how many items are ordered at one time. Thank you. 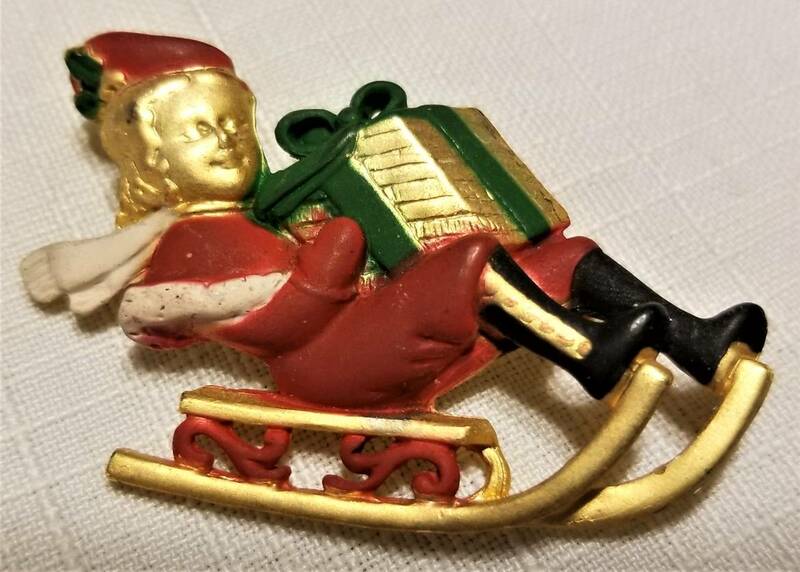 A cute pin of a boy speeding down the hill holding a gift for you! 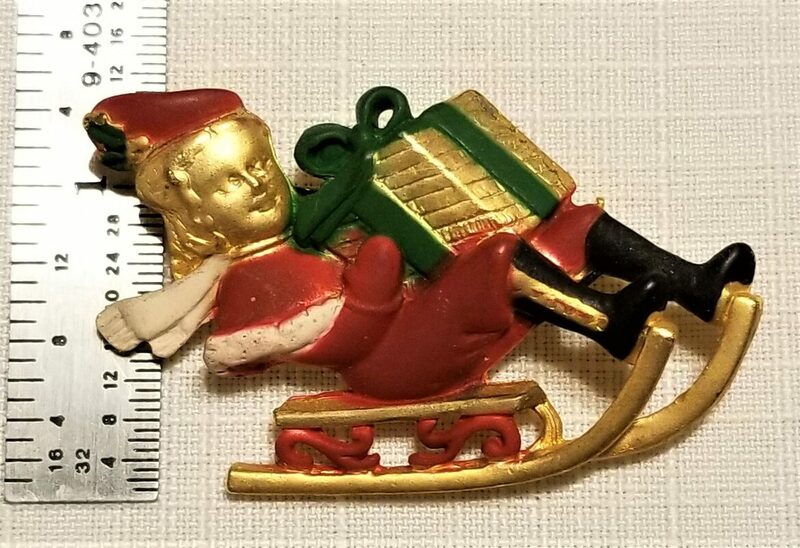 Vintage and is a collector's pin. Made by the AJC company. It is accented with red, green, black, and white. 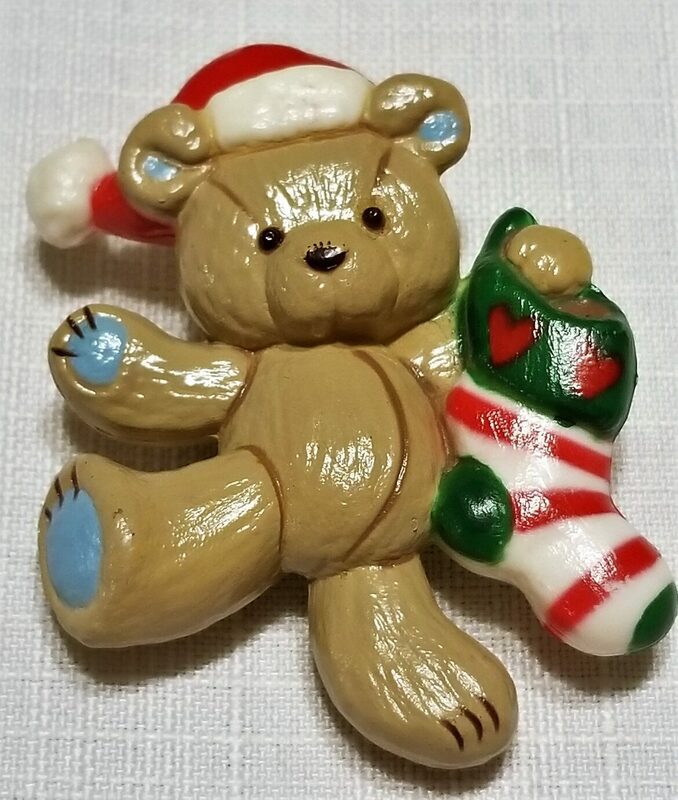 Perfect for a Christmas stocking stuffer or a token of love. Remember, I only charge one flat fee of $6.45 for delivery, no matter how many items are ordered at one time. Thank you! 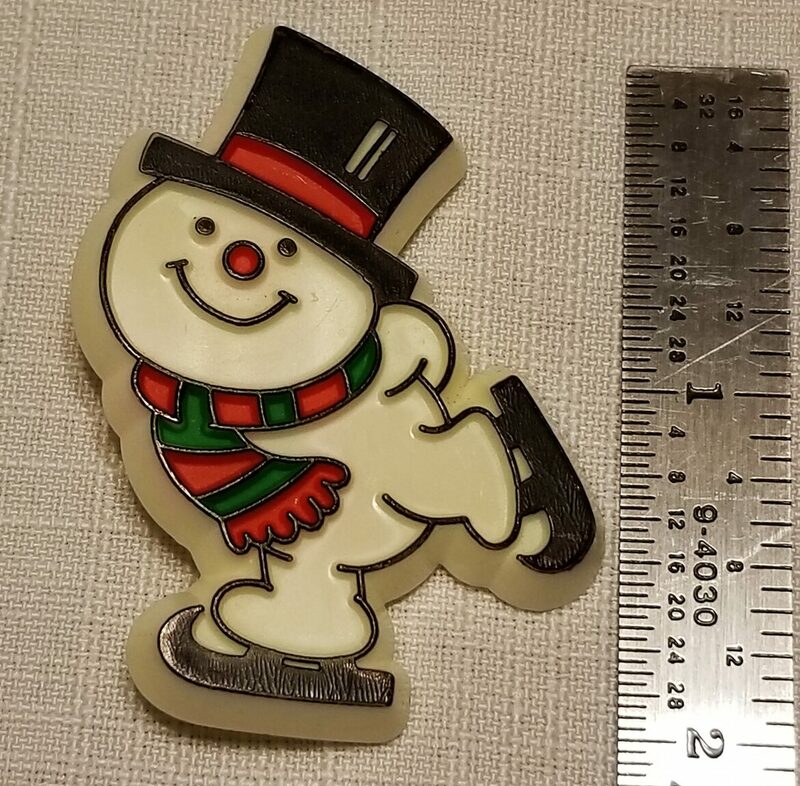 A vintage Hallmark pin of a snowman wearing a black top hat and holding a festive wreath. 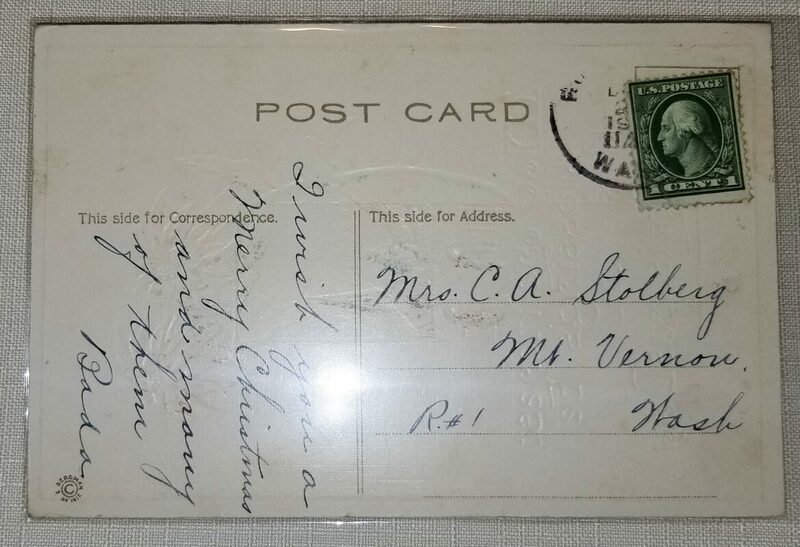 I can't find the Hallmark stamp on it. but there is a #1 in the lower right side on the back. I am not sure if this is actually from the 70s or 80s. 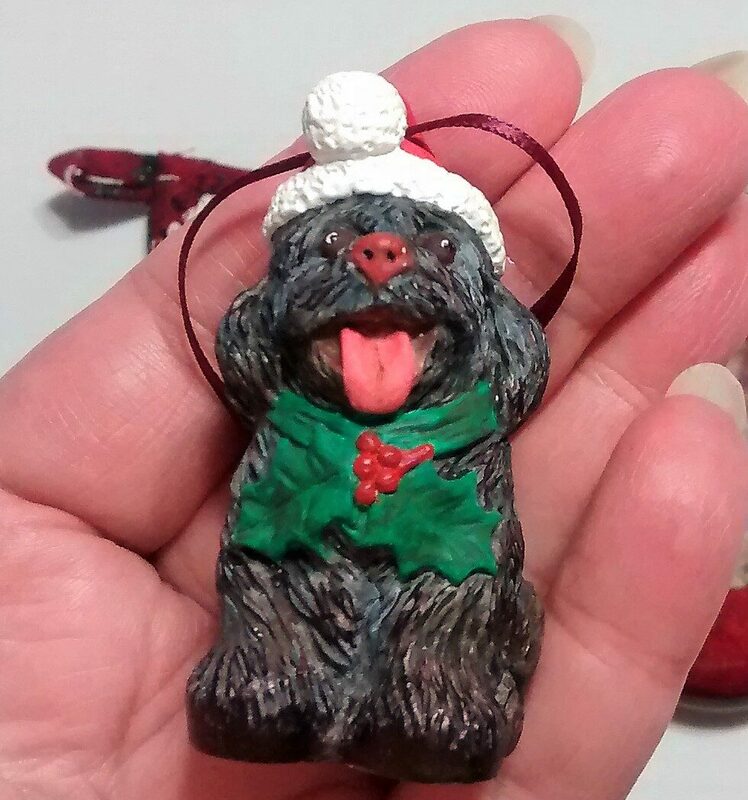 Perfect for a Christmas stocking stuffer or a token of love. 2 1/4 inches in length, 1 1/2 inches in width. 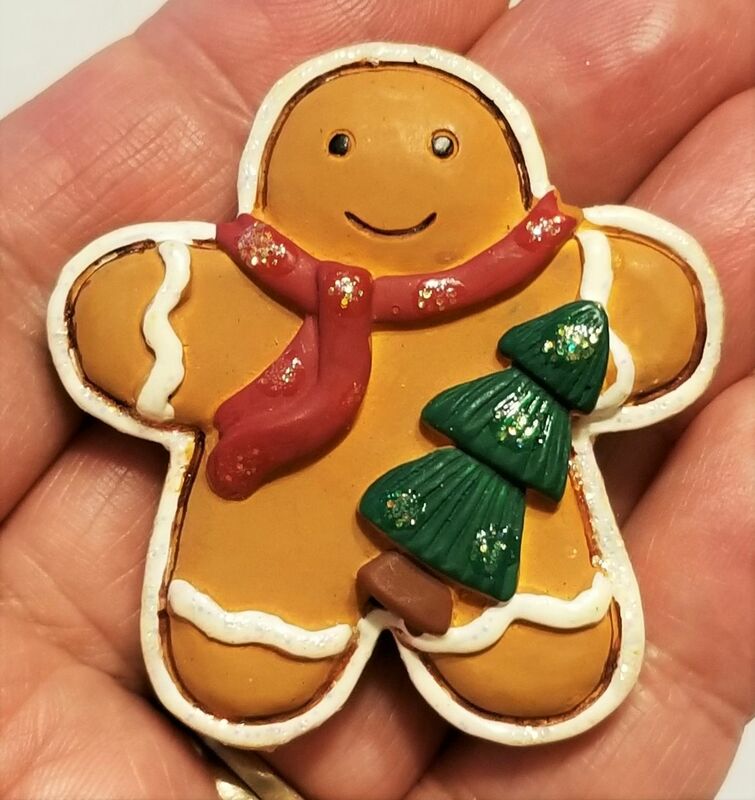 A cute, fat, sassy Gingerbread Boy Pin. Just as wide as he is tall. 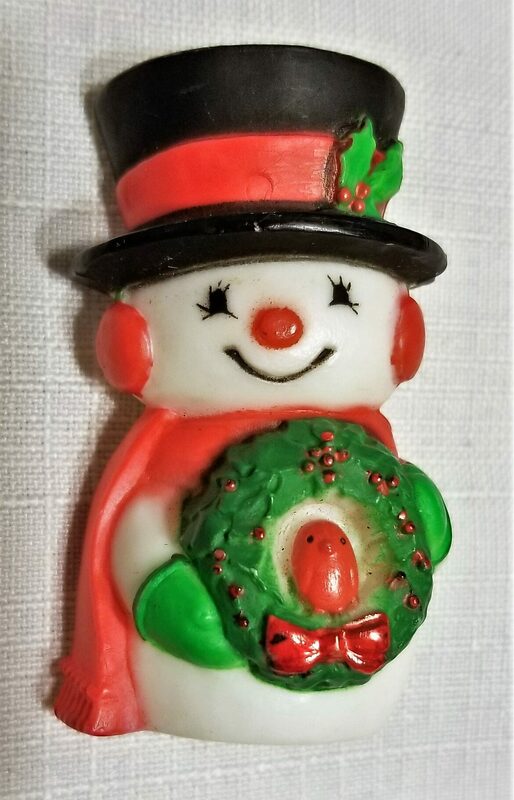 White pipping of frosting all around with a jaunty red scarf and holding a Christmas tree. 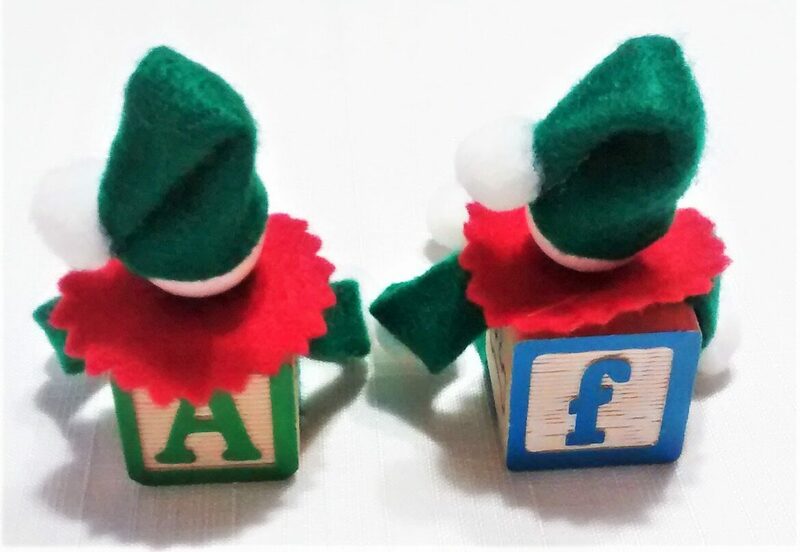 Perfect for a Christmas stocking stuffer or a token of love. 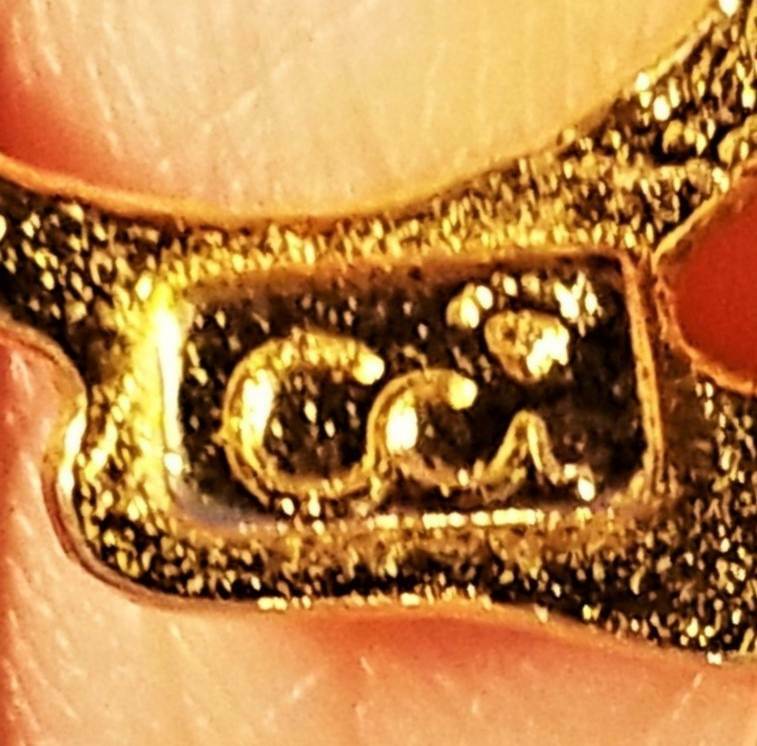 2 inches in length, 2 inches in width. No makers mark that I can see. 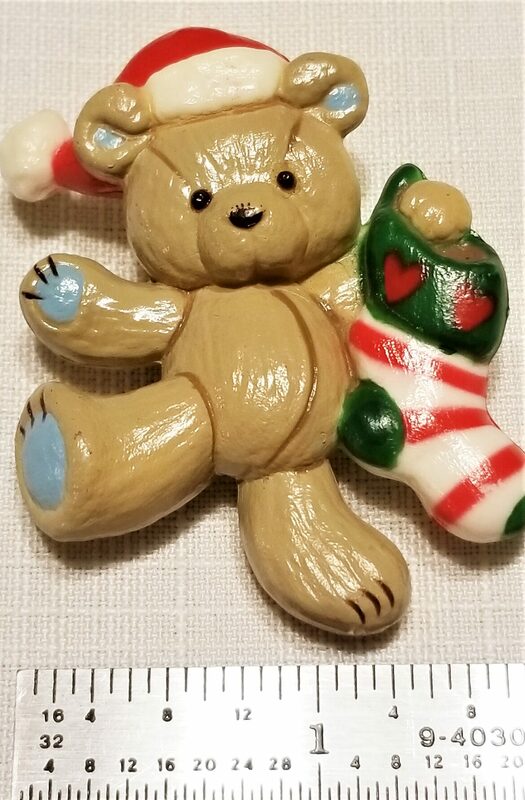 A collectible, cuddly, teddy bear for Christmas. 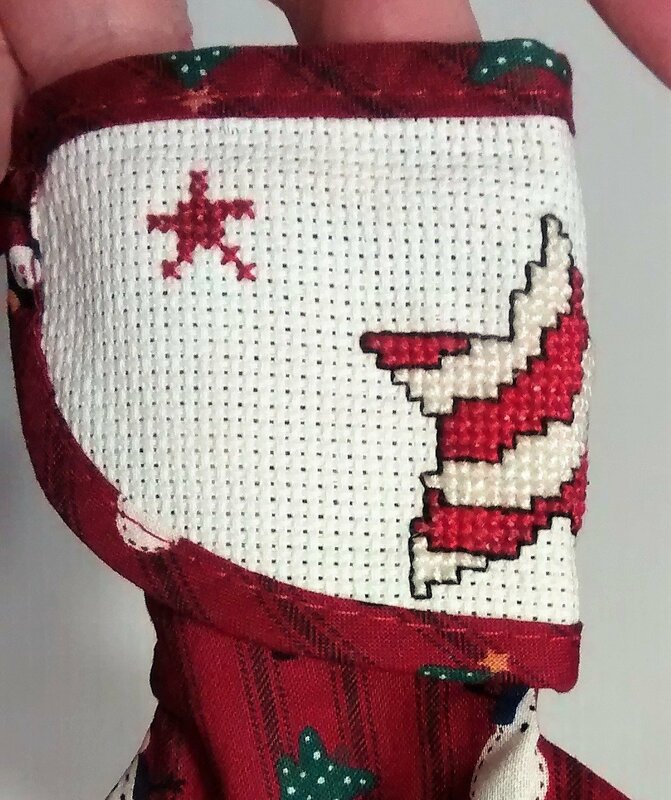 He is holding a stocking and wearing a Santa hat. 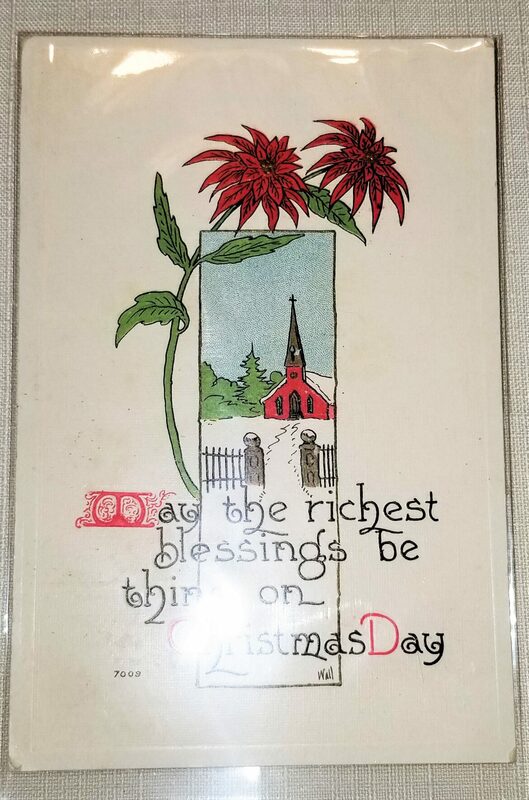 Perfect for a Christmas stocking stuffer or a token of love. 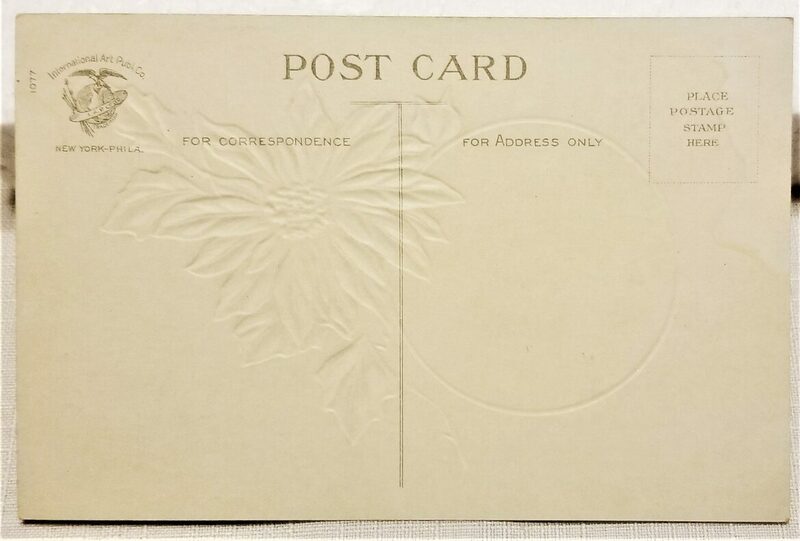 Gibson Greetings stamped on the back. 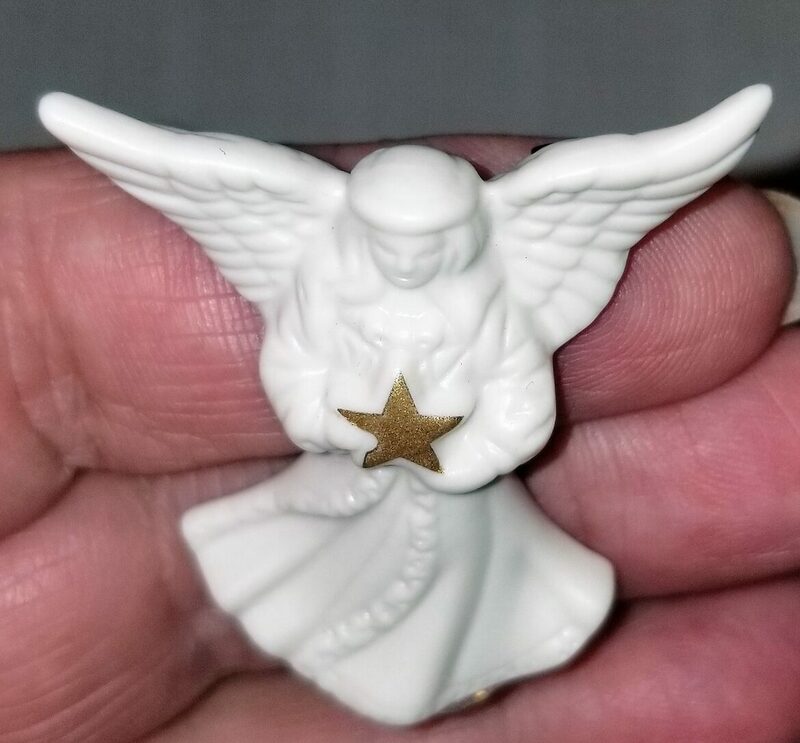 A fine china Angel pin embellished with a painted 24kt star by Lenox. So pretty and delicate. 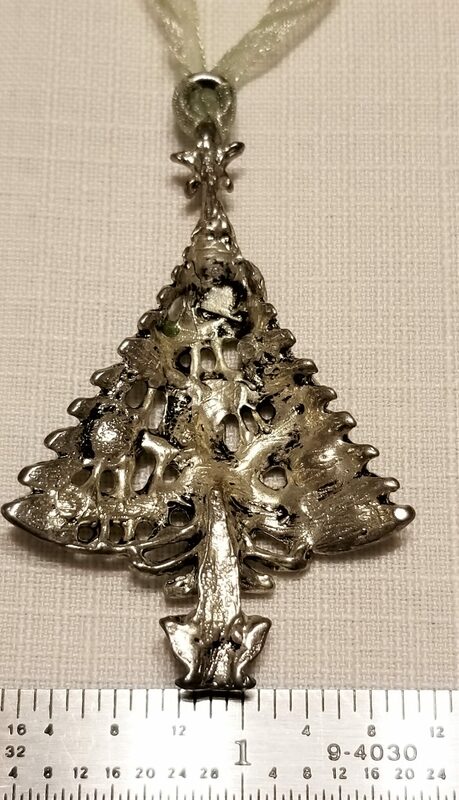 Could be worn any day, not just for Christmas season. Cream color. 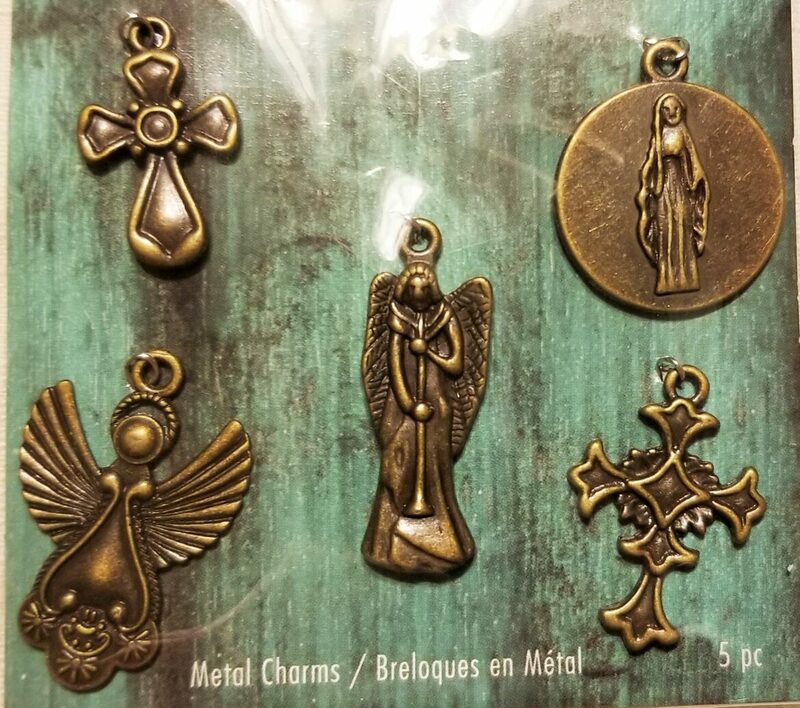 This is a set of five, antiqued brass charms of religious symbols, two angels, two crosses, and Madonna. 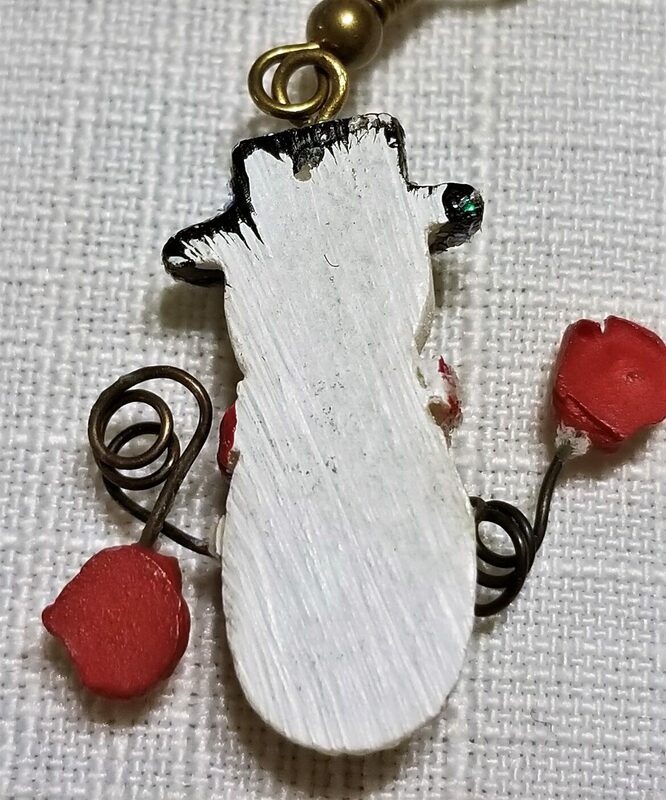 They would make a wonderful charm bracelet, charm necklace, or used in craft projects. 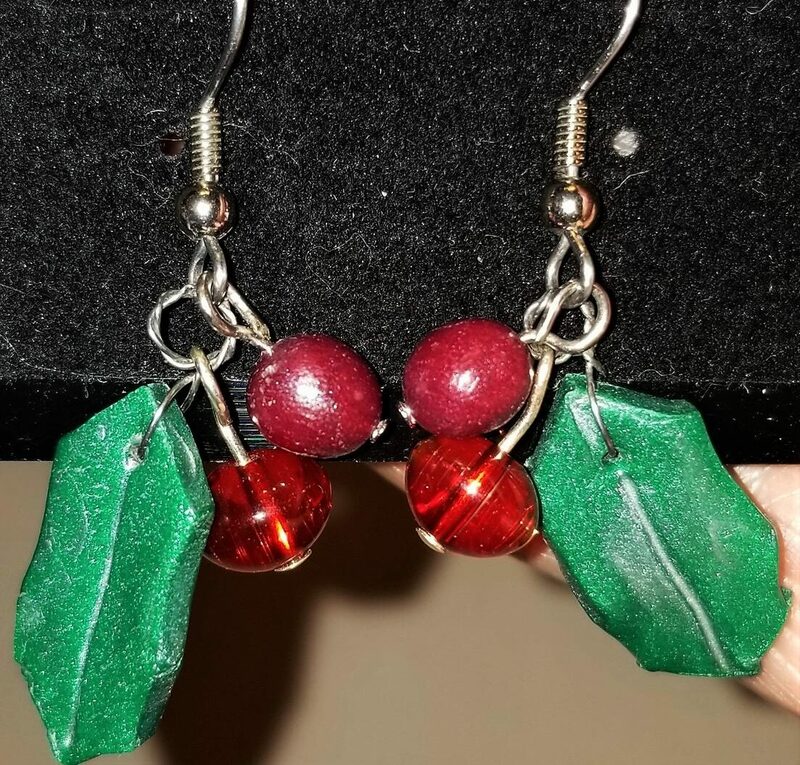 They are 7/8" to 1 1/4" in length. I think these are lovely. Please remember, I only charge one flat fee of $6.46 for delivery, no matter how many items are ordered at one time. Thank you. 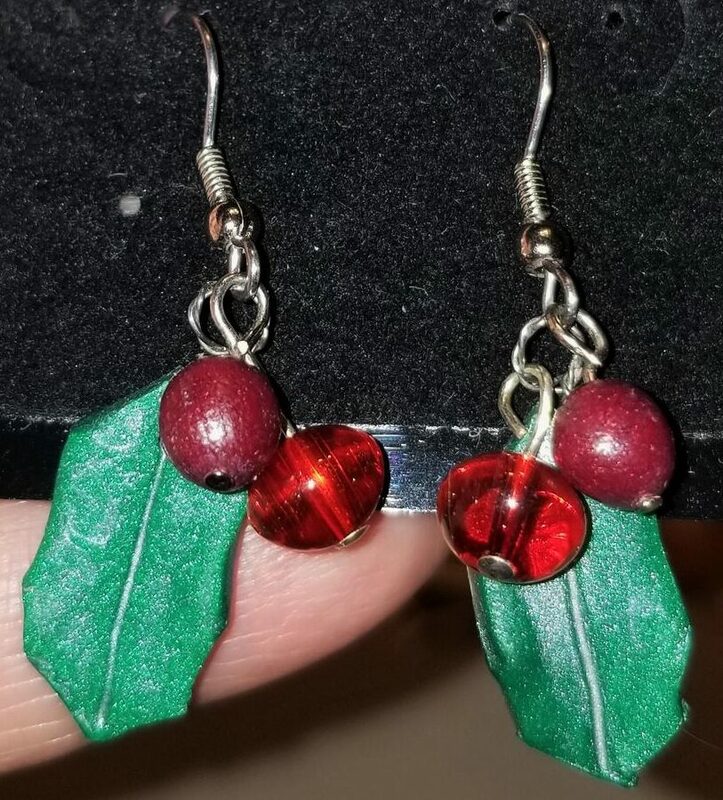 Christmas holly and berry earrings on french wires for pierce ears. 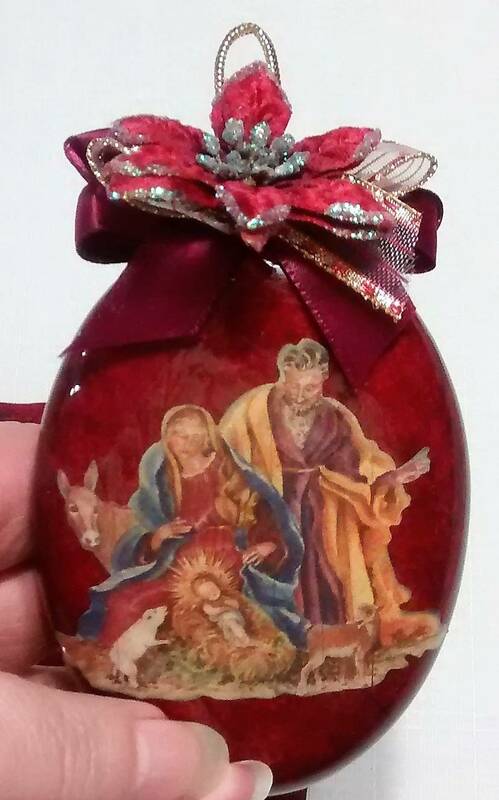 The holly is made with clay and the red berries are two types of beads. 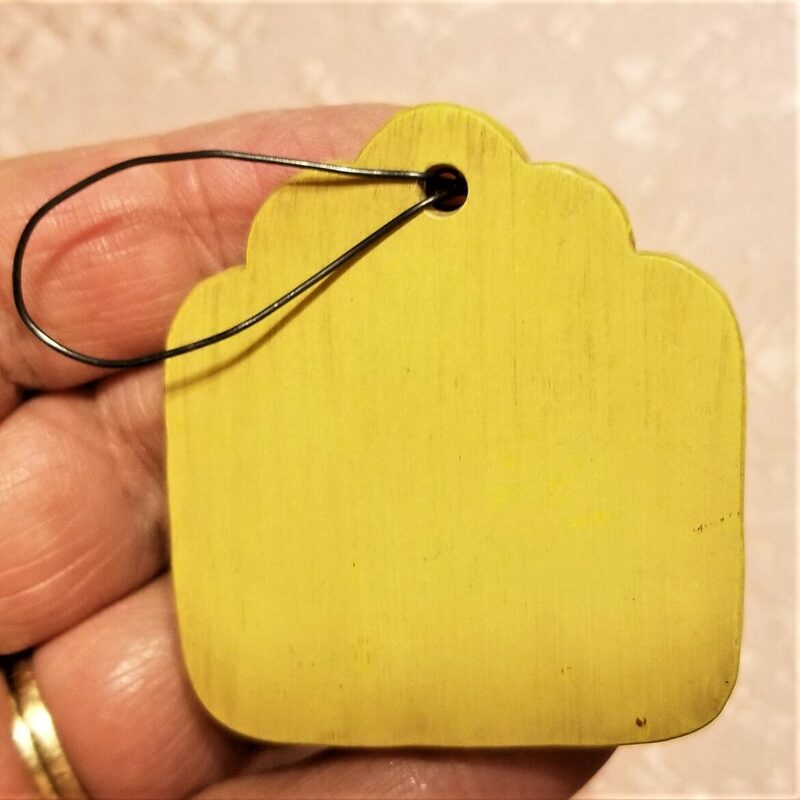 Cute little earrings approx. 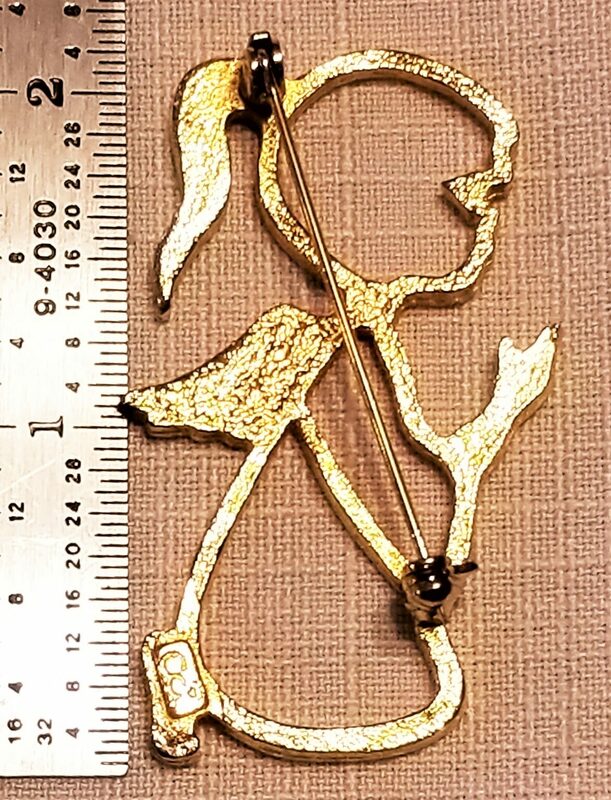 1 inch in length excluding the ear wire. Remember, I only charge on flat fee of $6.45 for delivery, no matter how many items are ordered at one time. Thank you! 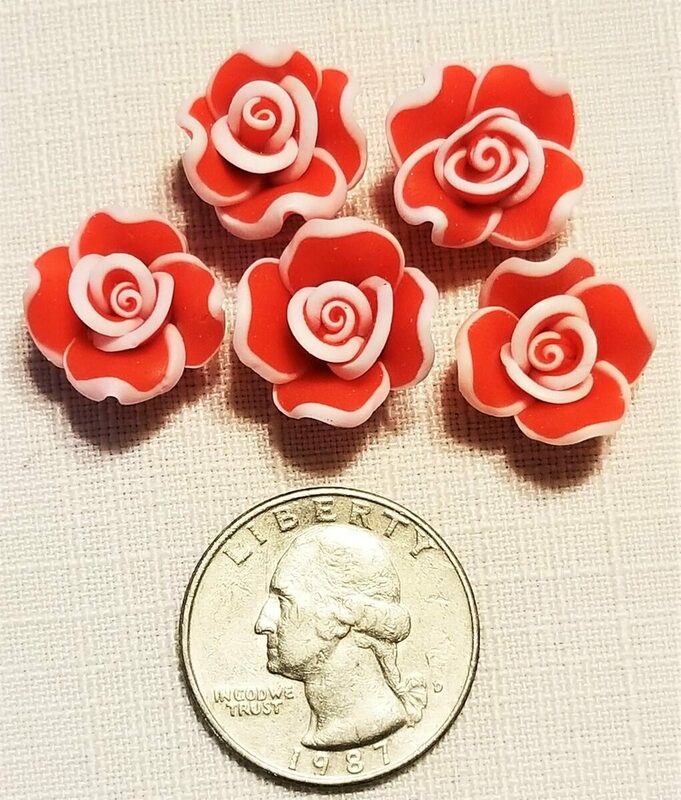 Five- 15 mm red with white tip polymer clay roses. Each rose has a hole drilled through the base for all kinds of crafting. Approximately 5/8 inches in diameter. 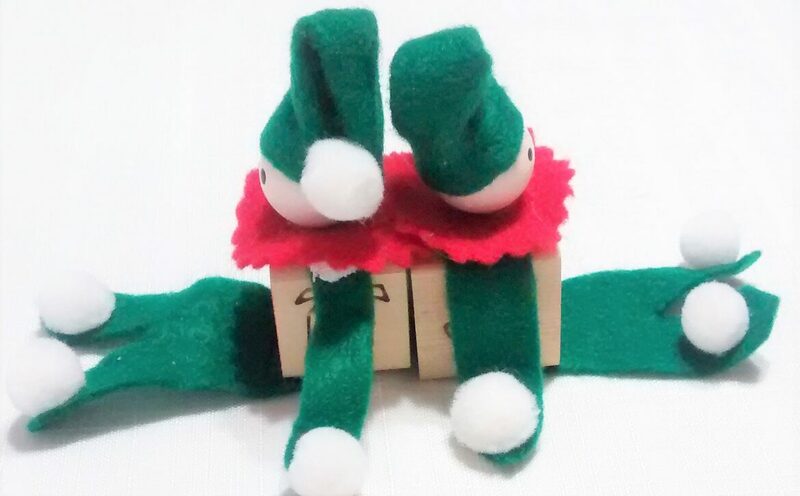 Two, cute, Christmas elves made with felt and a toy block for their bodies. Don't forget the pom poms too. Red, green, and white. 5 inches in length and 2 inches in width. 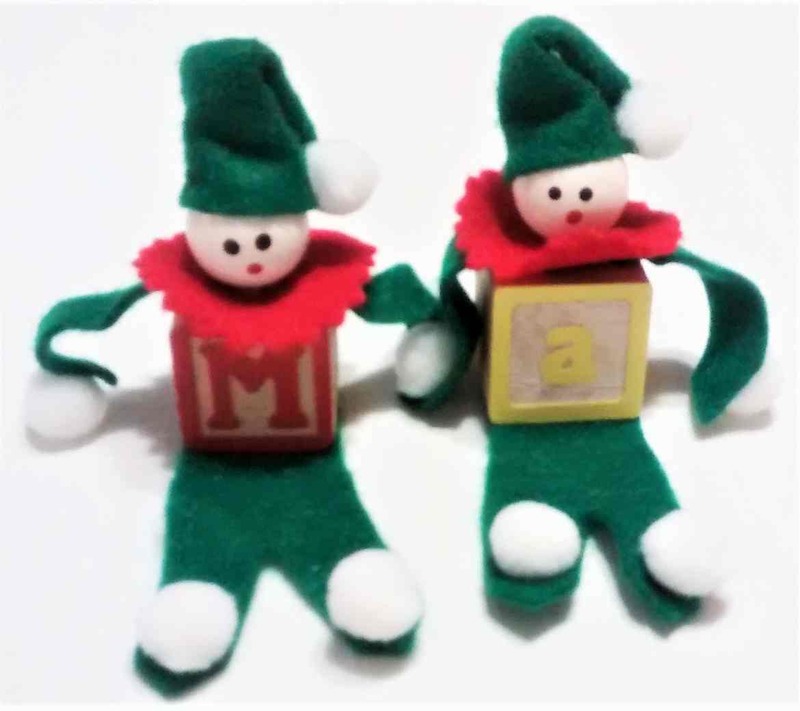 Could be used as package toppers, accents to wreaths, Christmas shadow boxes, small vignettes. Remember, that I only charge one flat delivery fee of $6.45, no matter how many items are ordered at one time. 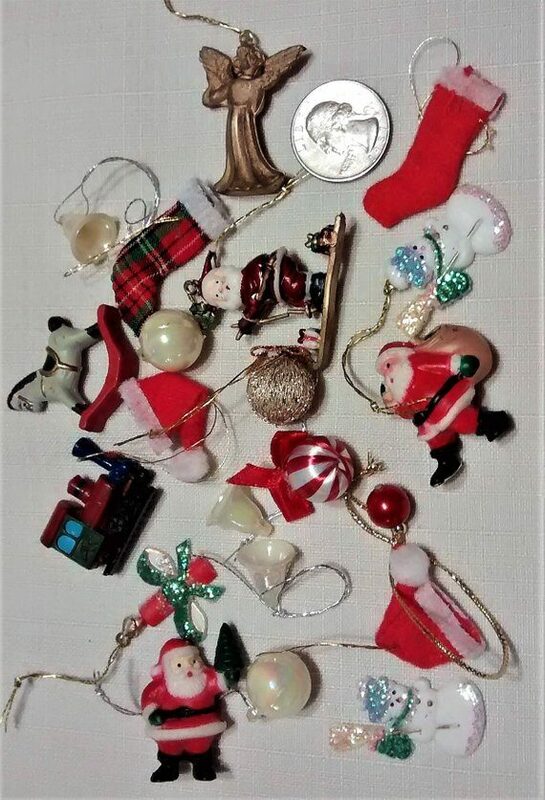 Assorted Christmas ornaments. 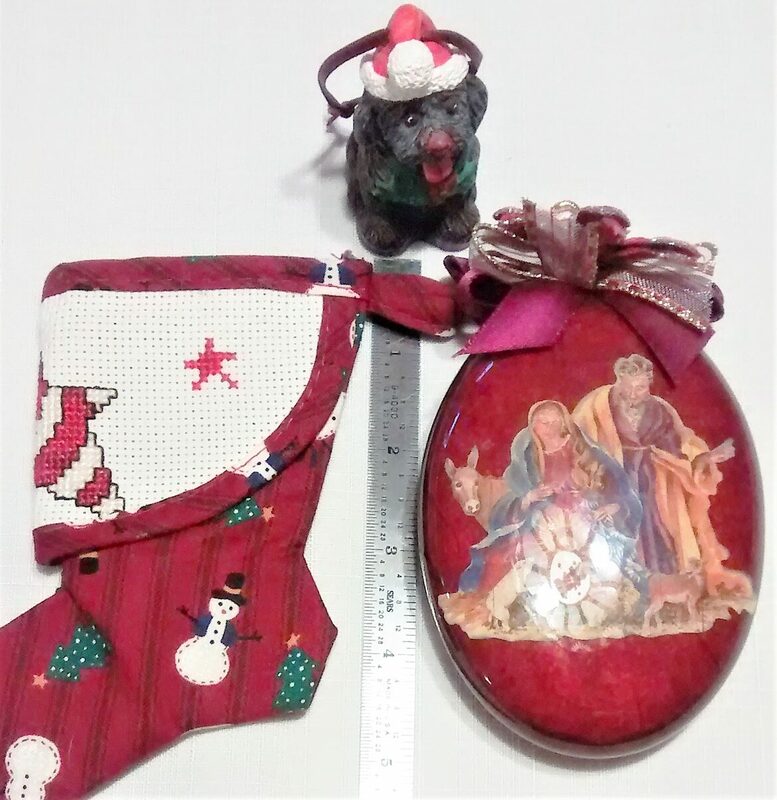 A cute, little Scottie Dog, a maroon, 5", oval ornament with the holy family on it, and a small, hand cross stitched, 5" x 3" stocking. All in great condition and ready for great crafting ideas. 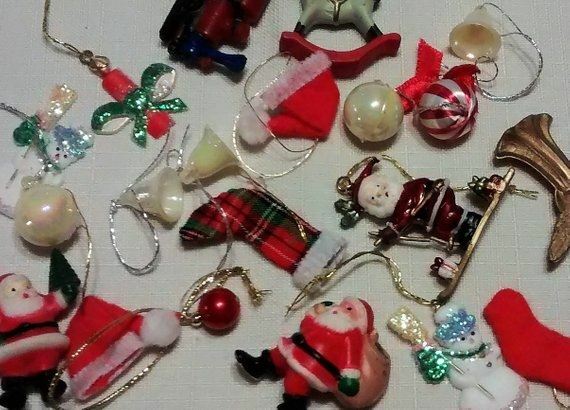 Wreath making, Christmas shadow boxes, Christmas vignettes, package toppers, even use them as traditional ornaments. Remember, that I only charge one flat delivery fee of $6.45, no matter how many items are ordered at one time. Thank you! 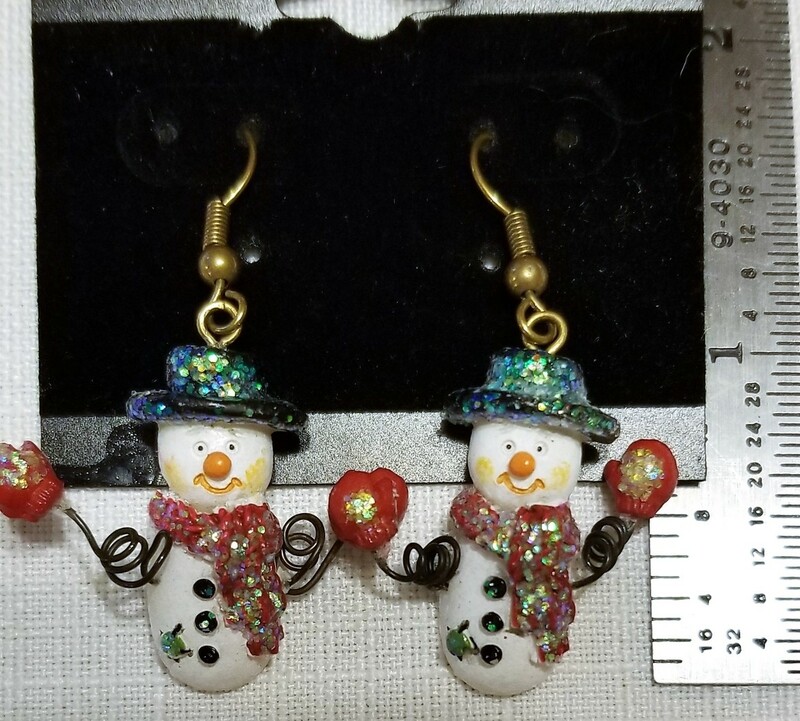 Christmas snowman earrings on french wires for pierce ears. 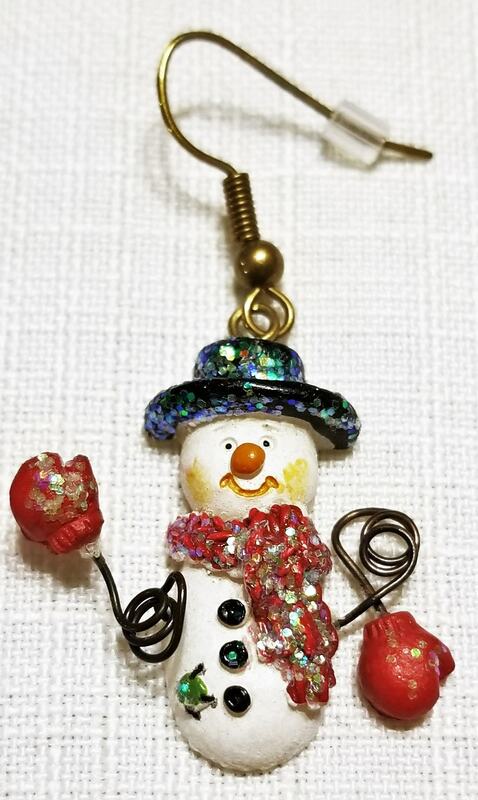 These are cute, funny, snowmen with loopy arms. Whimsical. 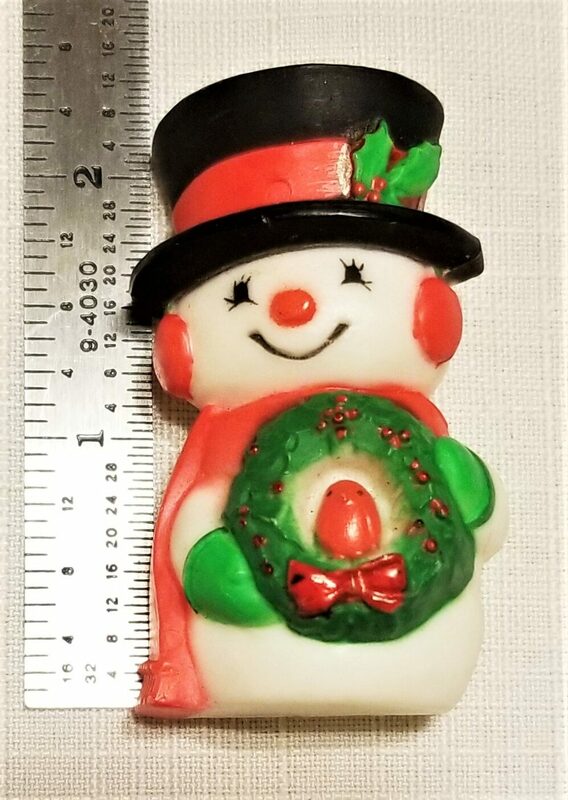 Snowman is 1 inch in length and 1 inch in width. 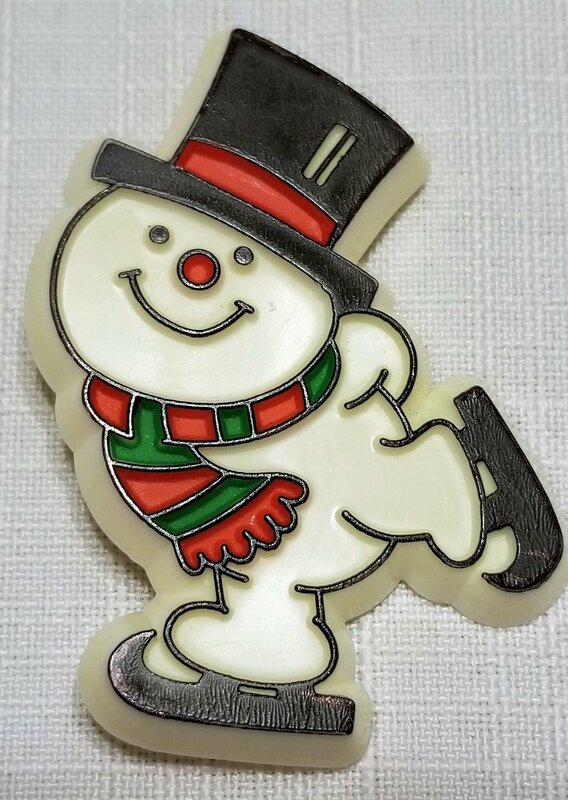 A vintage Hallmark pin of a snowman ice skating happily along. It has turned a bit yellow from age, but it is otherwise in great condition. I am not sure if this is actually from the 70s or 80s. 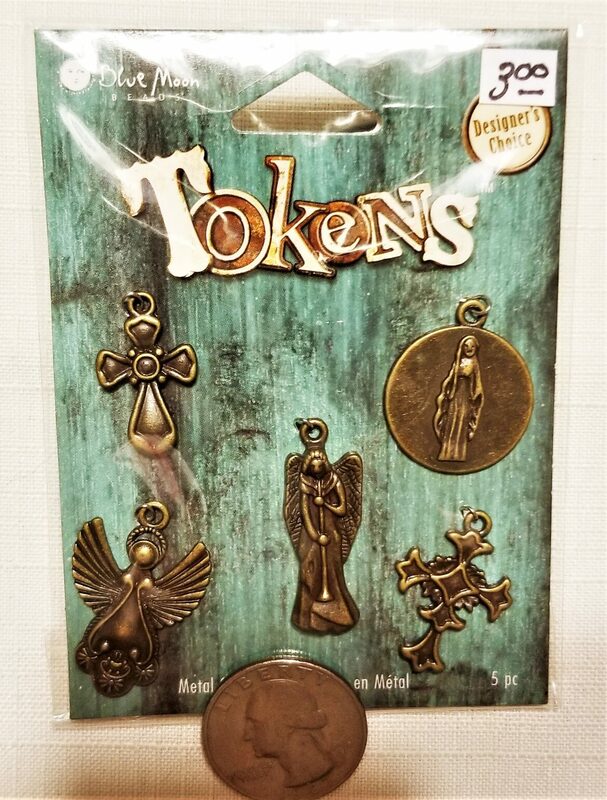 Perfect for a Christmas stocking stuffer -great for a collector. 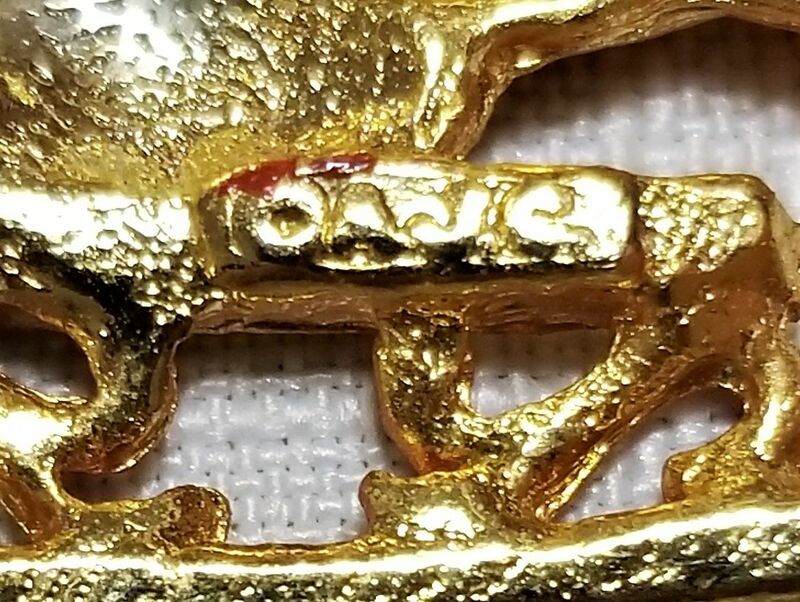 2 inches in length, 1 1/2 inches in width. 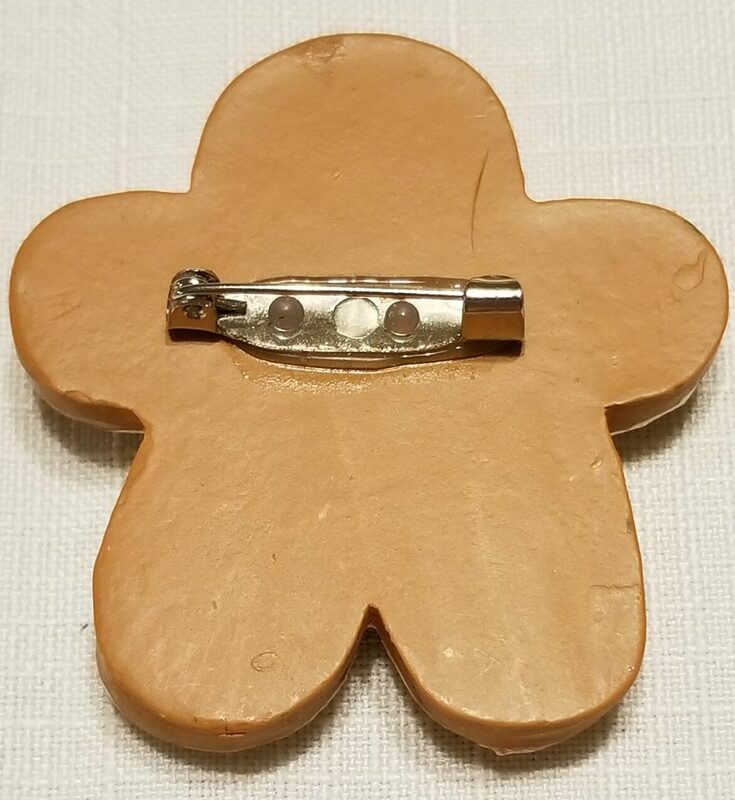 This is a Christmas ornament by B. Lloyd (2003) of a gift tag with a gingerbread man on the front. Wire loop to hang it from. Well made. 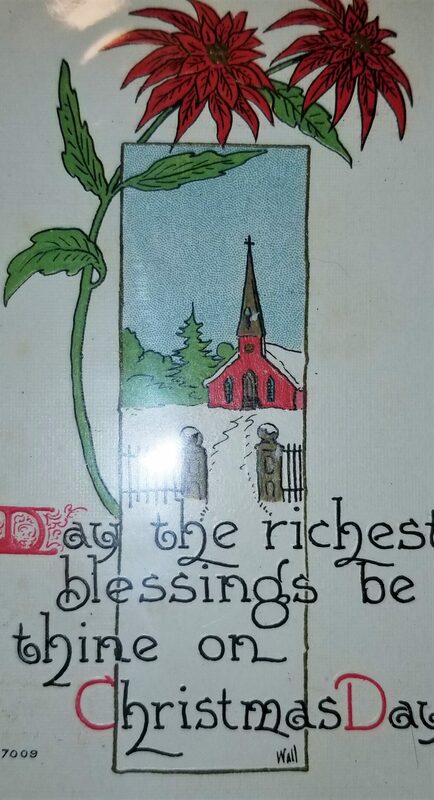 It is in great condition and ready for great crafting ideas. 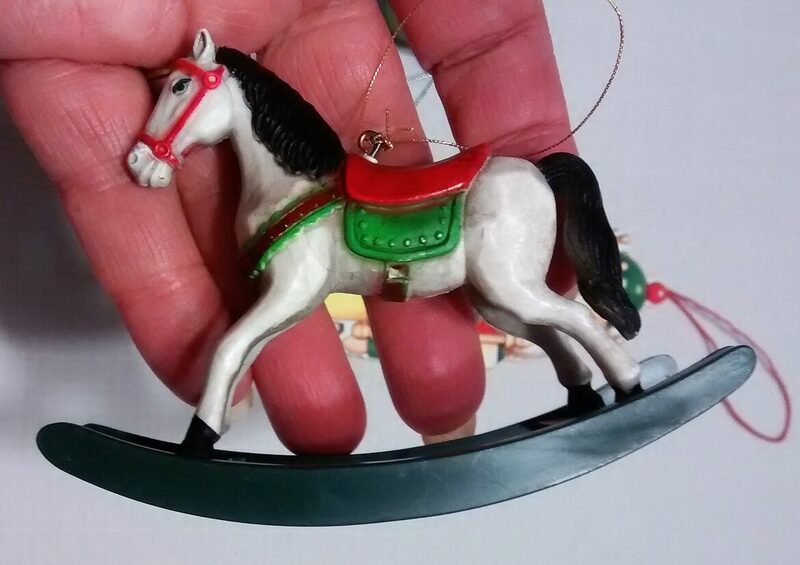 Wreath making, Christmas shadow boxes, Christmas vignettes, package toppers, even use it as a traditional ornament. 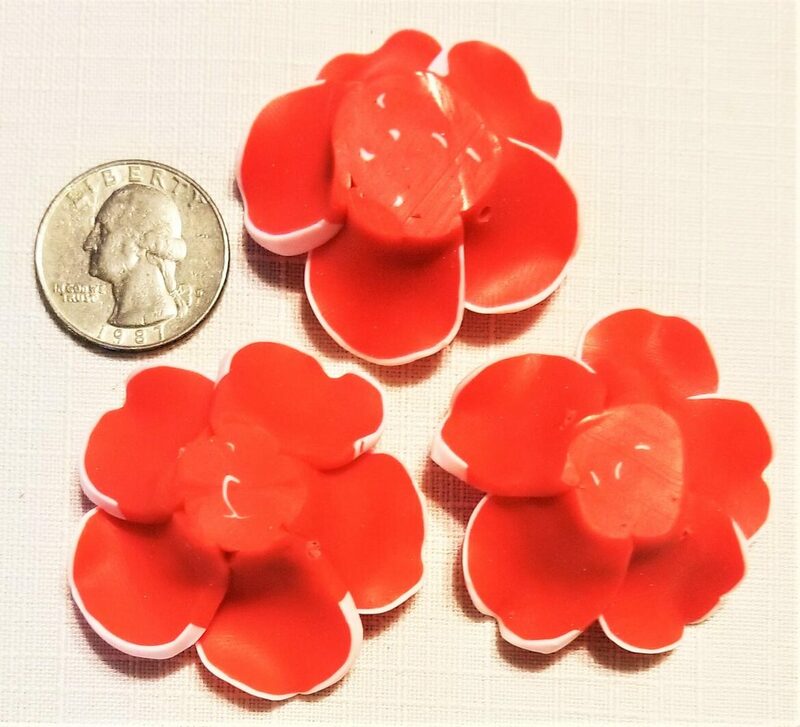 2 1/4 inch in length, 2 inch in width.Remember, that I only charge one flat delivery fee of $6.45, no matter how many items are ordered at one time. Thank you! 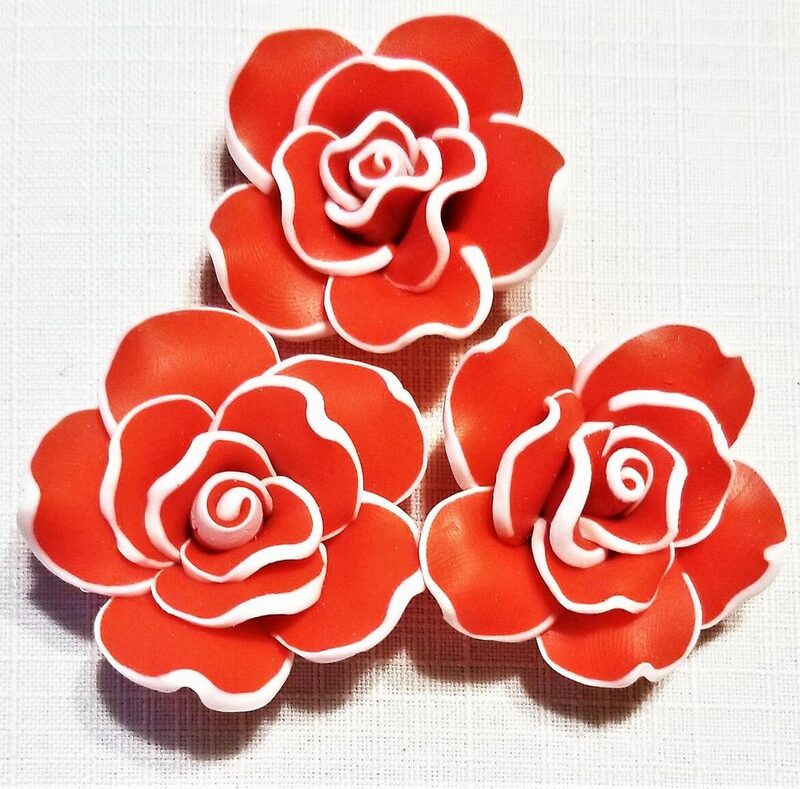 Three 45 mm red with white tip polymer clay roses. 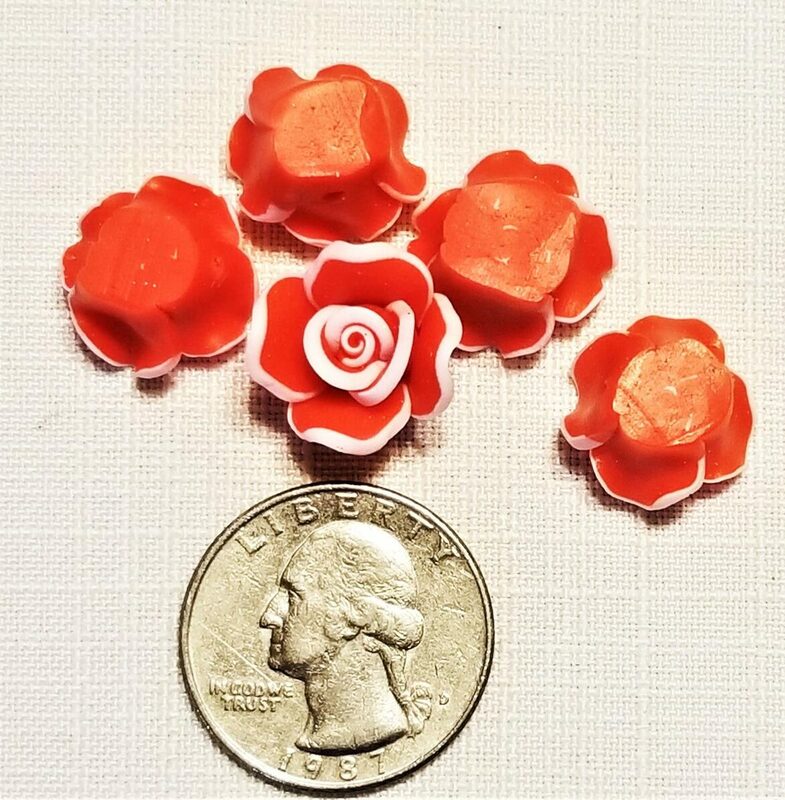 Each rose has a hole drilled through the base for all kinds of crafting. Approximately 1 1/2 inches in diameter. Remember, I only charge one flat fee of $6.45 for shipping, no matter how many items are ordered at one time. Thank you! 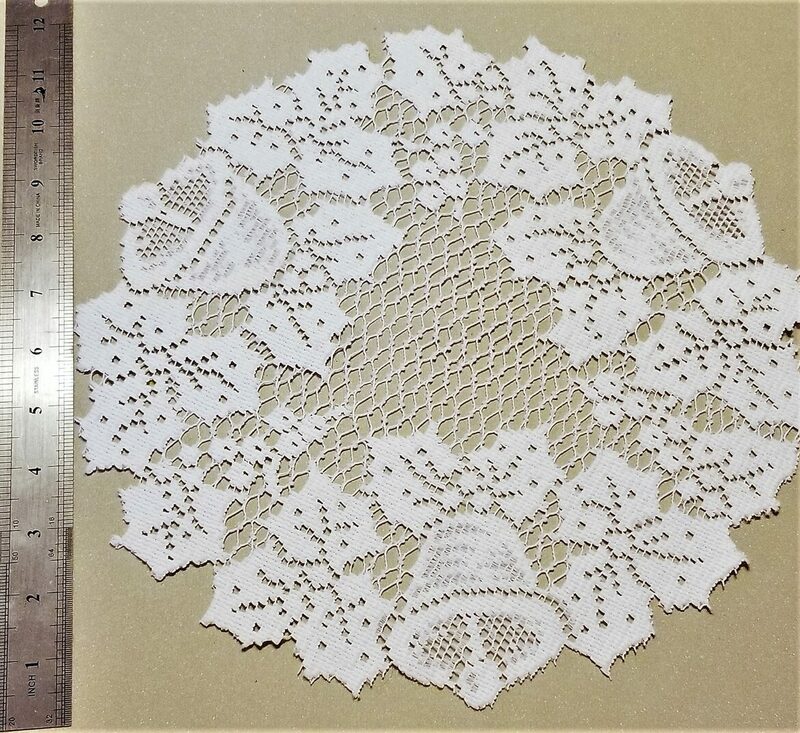 This is a round 12 inch in diameter, lace Christmas doily. Bright white. 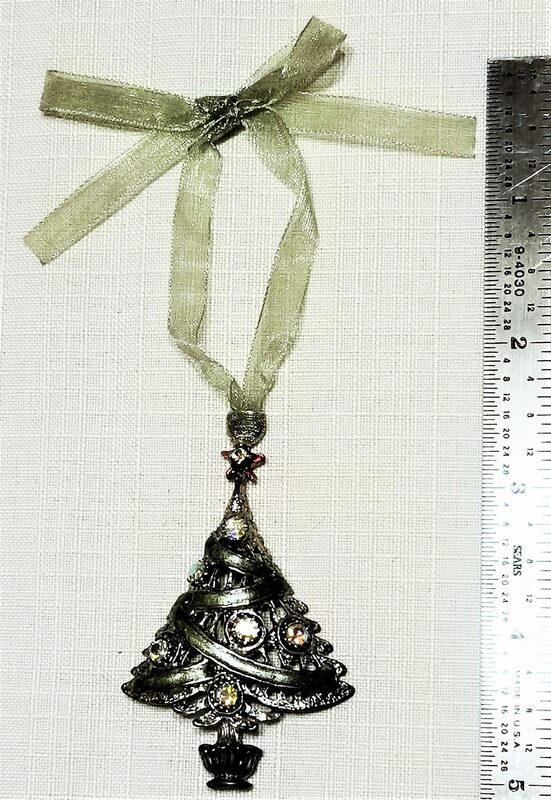 Festive bells and holly all around the outside edge. 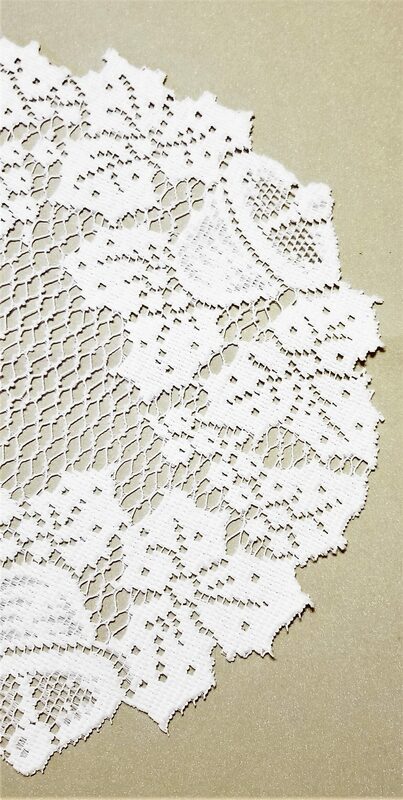 This doily can be used whole or cut up for crafts. 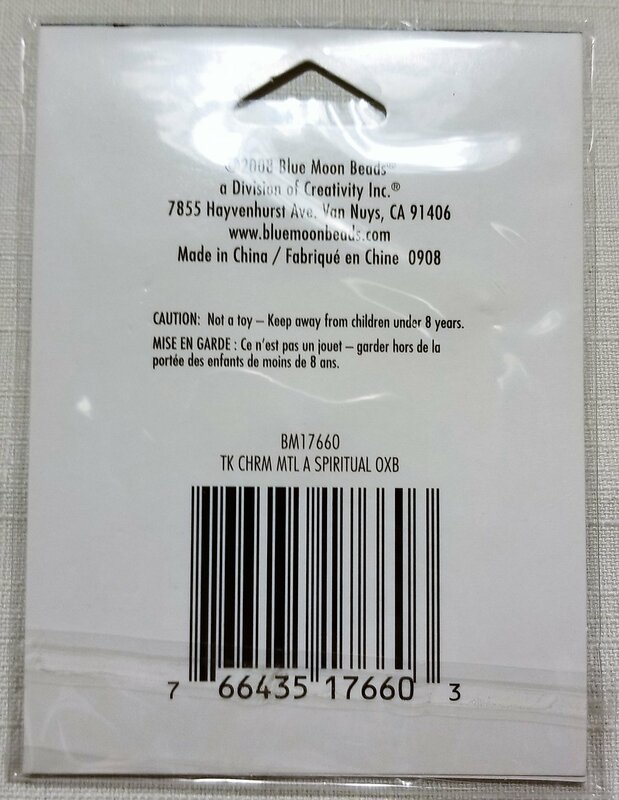 Use on pillows, in quilt making, add as an enhancement for shadow boxes, doll making, paper crafts, etc. Remember, I only charge one flat fee for delivery of $6.45, no matter how many items are ordered at one time. Thank you. 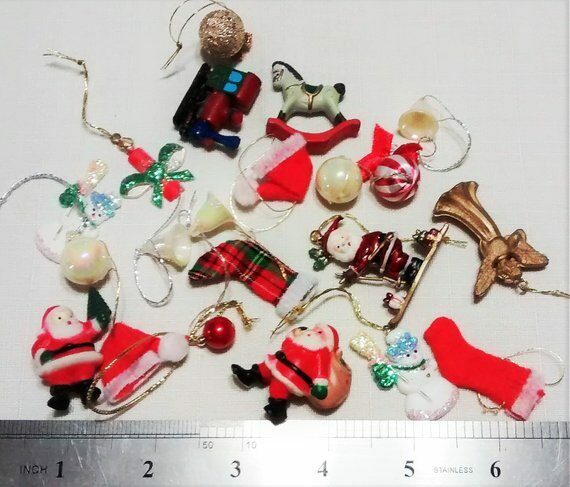 Assorted Christmas ornaments. 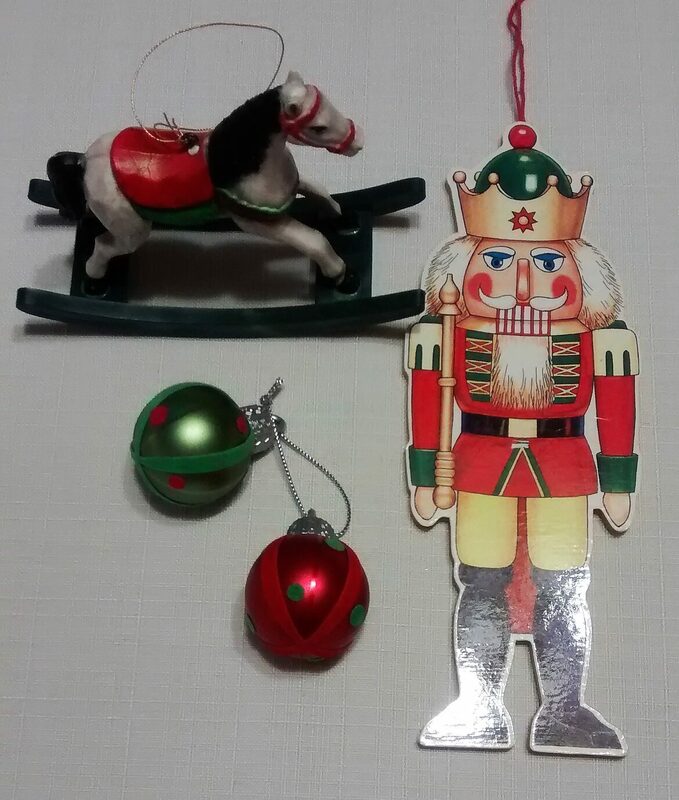 A nutcracker, rocking horse, and Christmas balls. All in great condition and ready for great crafting ideas. 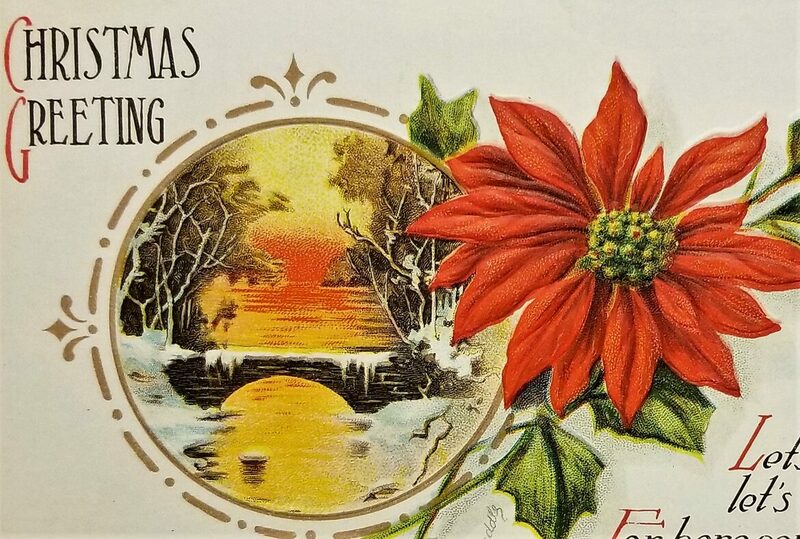 Wreath making, Christmas shadow boxes, Christmas vignettes, package toppers, even use them as traditional ornaments. 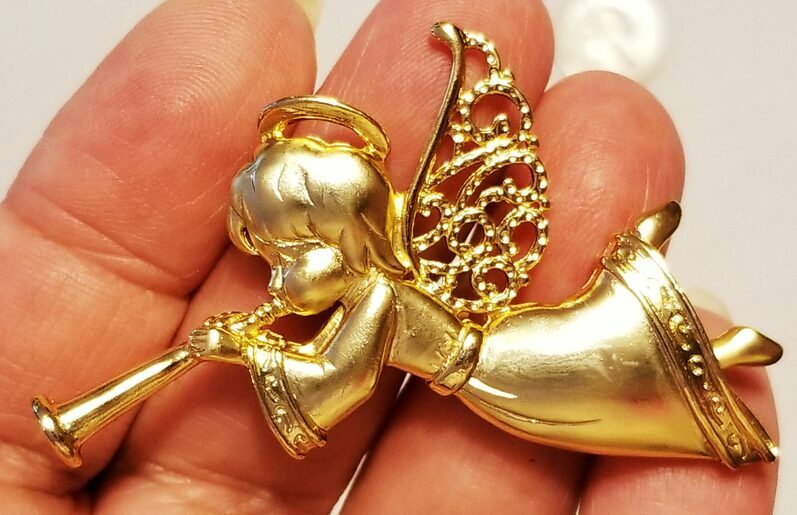 Vintage, CCi jewelry company, gold tone pin with the silhouette of a kneeling and praying angel. 1980s. 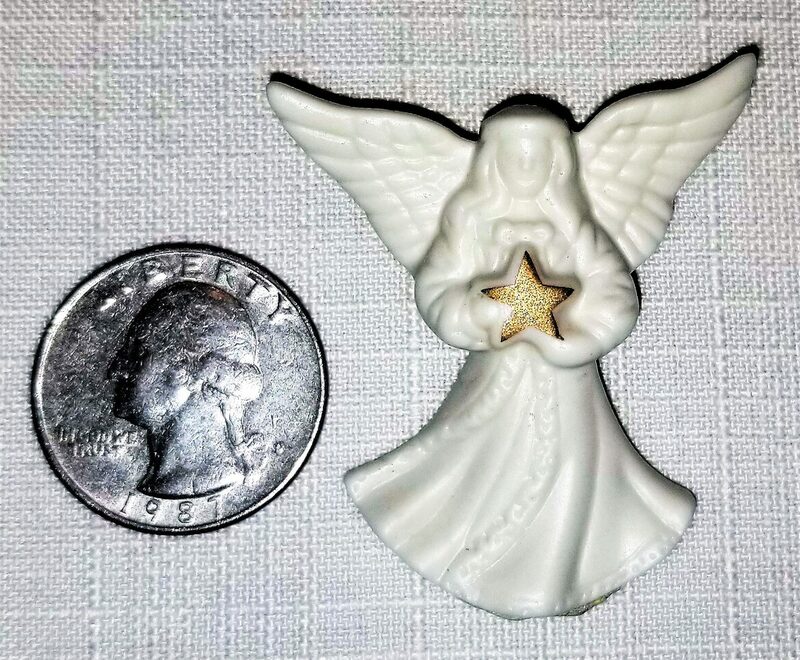 The little angel has a light blue rhinestone eye, sparkly rhinestone wings, and a rhinestone ponytail holder. 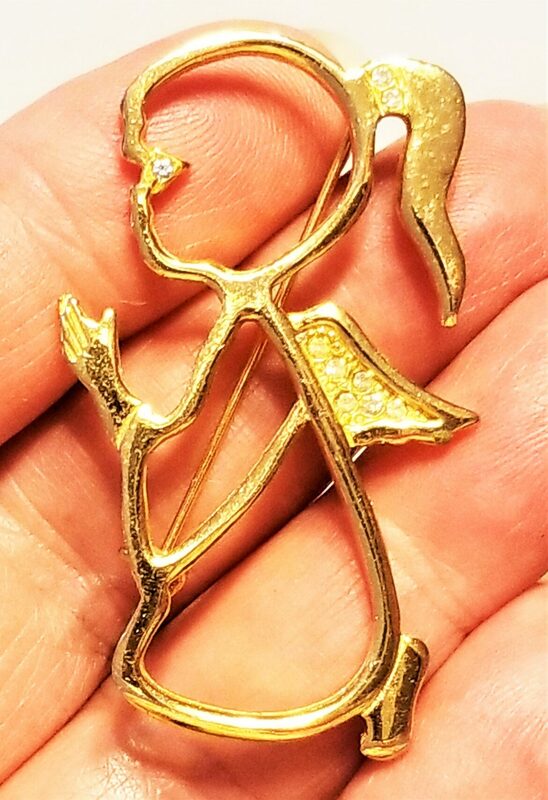 Smooth gold tone metal. In great condition. 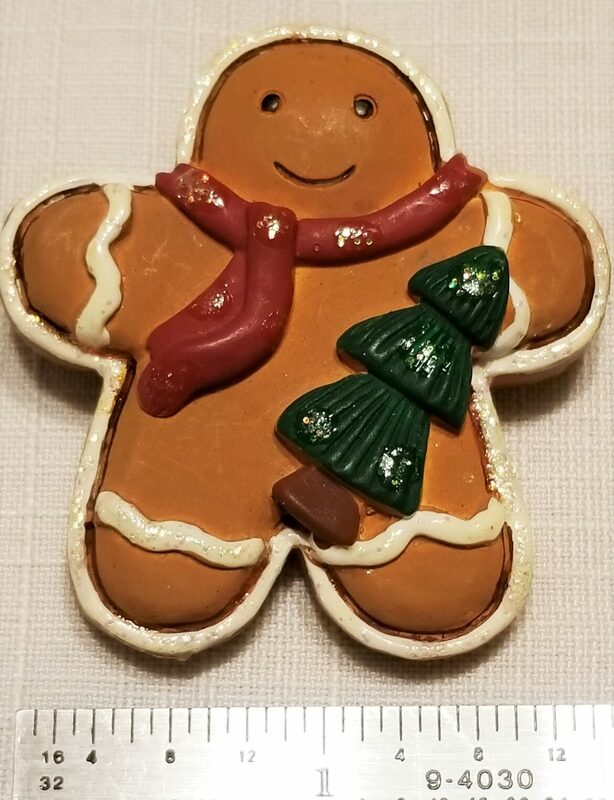 A great stocking stuffer or a gift of love. 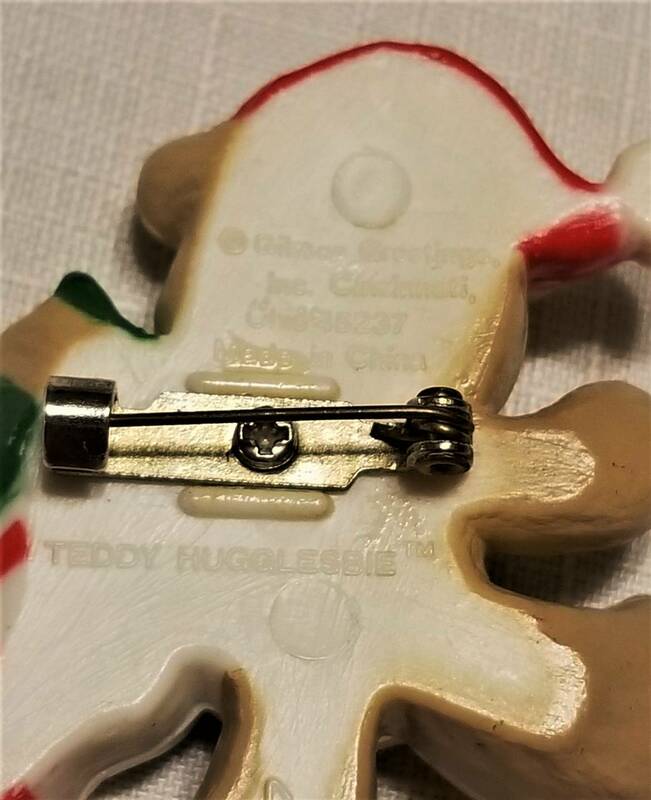 21/4" in length and 1 1/4" in width. 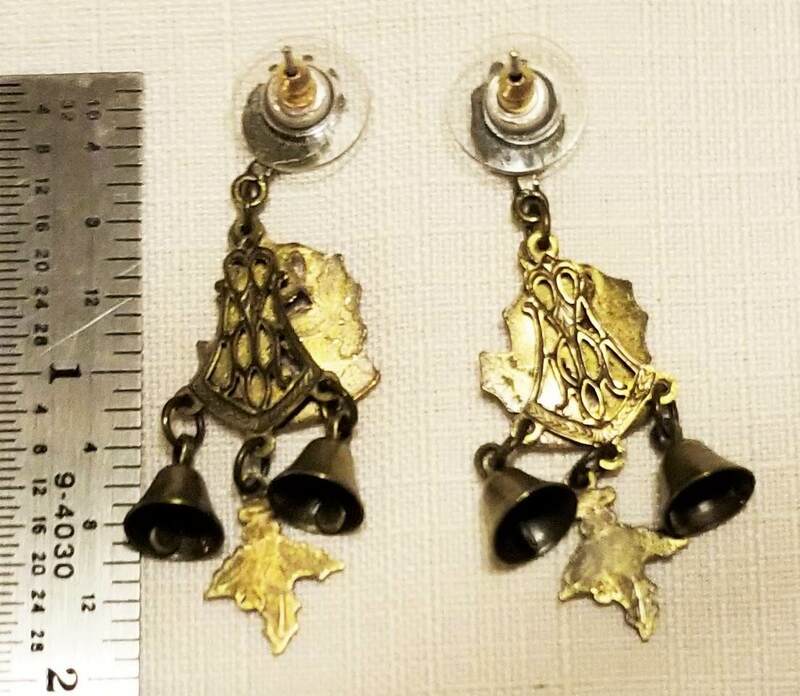 Christmas Noel earrings of antique brass and festive dangles. 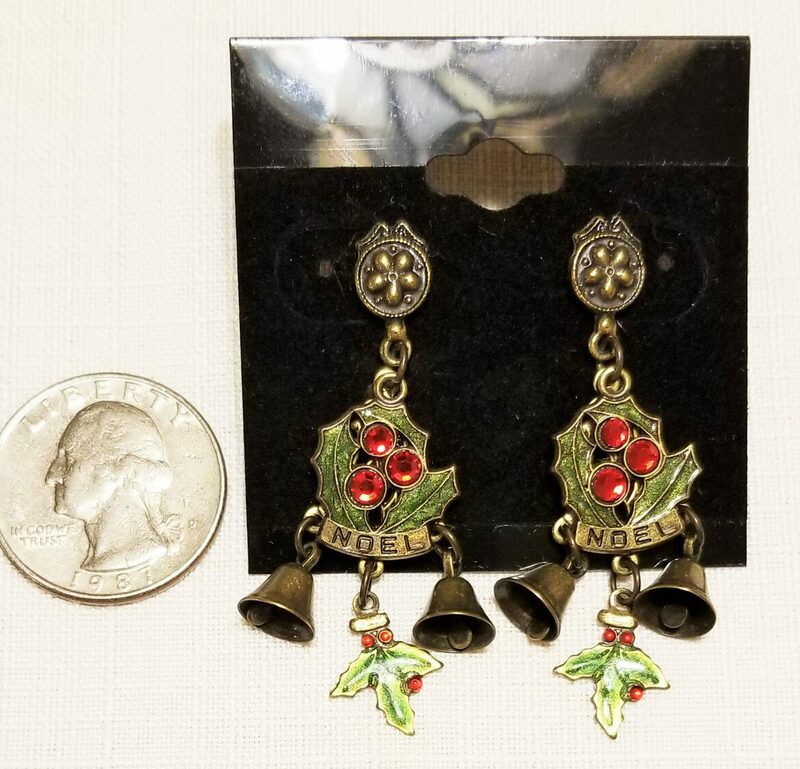 Bells, holly leaves, and eye-catching red rhinestone holly berries. 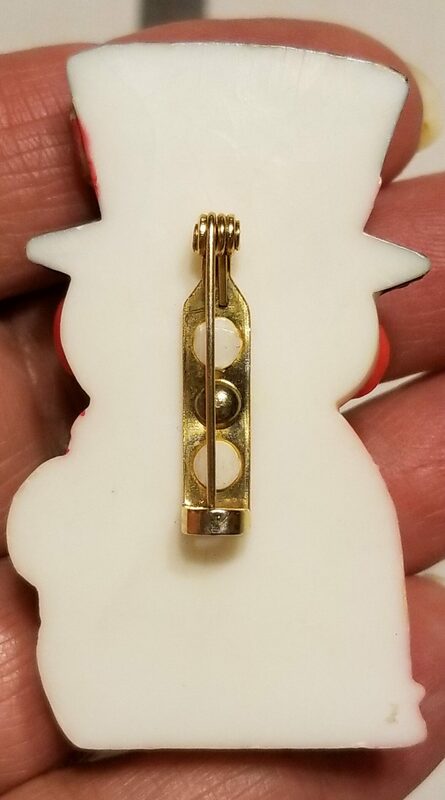 They have backs for pierced ears. Two inches in length and approx. 3/4 inch in width. No makers mark that I can see. Very pretty and delicate. 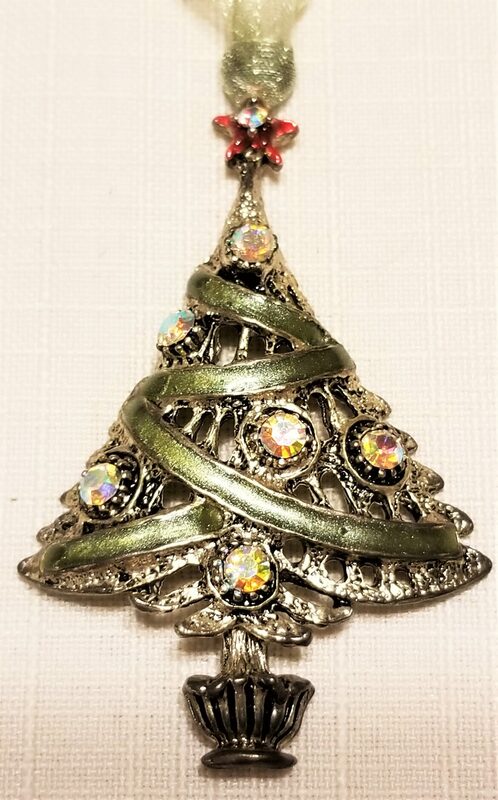 This is a pewter ornament of Christmas tree decorated with 7 faceted Aurora Borealis crystals and green swag. Hangs from a green ribbon. Gorgeous and well made. It is in great condition and ready for great crafting ideas. 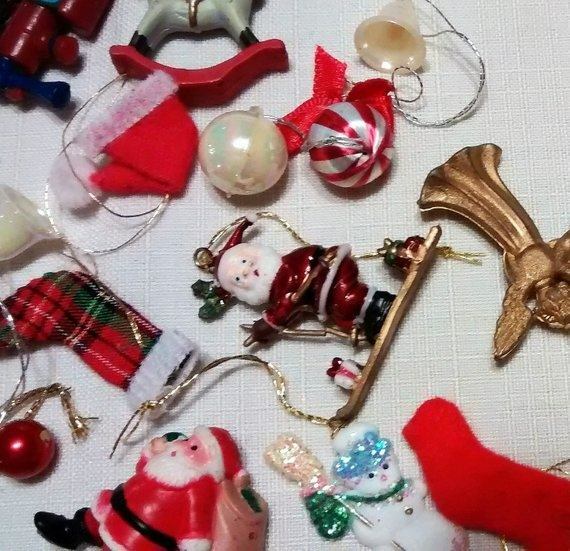 Wreath making, Christmas shadow boxes, Christmas vignettes, package toppers, even use it as a traditional ornament. No makers mark that I can find. 2 1/2 inch in length, 1 3/4 inch in width. 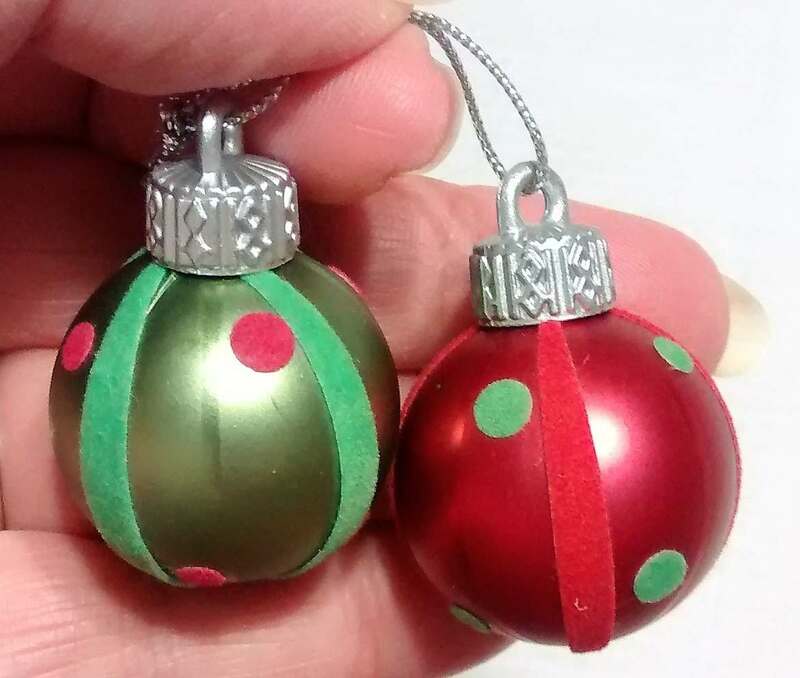 These are small, cute Christmas decorations. There are a variety of approximately 20 items in each group. They look vintage to me. Remind me of the 50s. 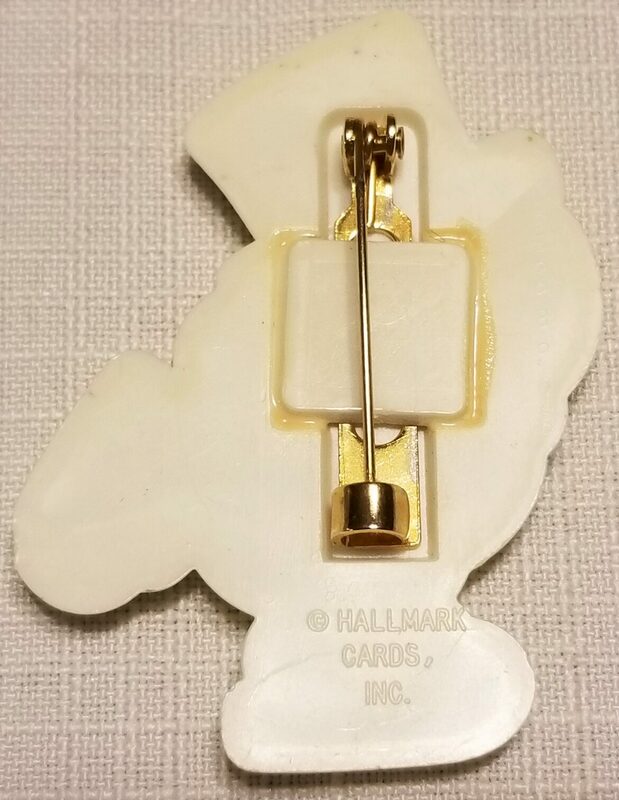 What is pictured is a sample. All are similar, but not identical. To judge size check the pictures above and compare them to the ruler or quarter pictured. Please remember that I only charge one flat fee for shipping of $6.45, no matter how many items are ordered at one time. Thank you!